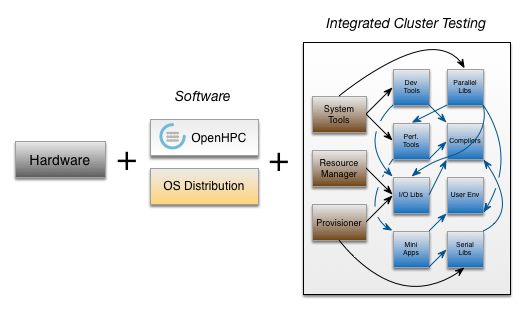 Note that the above functionality groupings are also used to organize work-item issues on the OpenHPC GitHub site via labels assigned to each component. The docs/ directory in the GitHub repo houses related installation recipes that leverage OpenHPC packaged components. The documentation is typeset using LaTeX and companion parsing utilities are used to derive automated installation scripts directly from the raw LatTeX files in order to validate the embedded instructions as part of the continuous integration (CI) process. Copies of the latest documentation products are available on the Downloads page.